Our specially customized equipment and years of experience in Alaska allow us to complete jobs faster and reach more remote areas than anyone. K30 4x4 3’ high tires with 20’ mast. Capable of getting into and out of most places with minimal impact to the property. Available for our complete range of services. Call for more information about the capabilities of this rig! Mountable on all terrain tires or skis. Can be loaded on a plane and towed behind a snow machine or 4-wheeler for access to very remote areas. 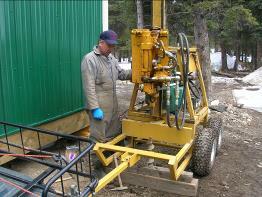 Available for standard penetration, environmental and water wells, and solid stem augers. Call for more information about the capabilities of this rig! All terrain drill mounted track vehicle. 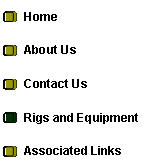 Similar service availability as the Mobile B24. 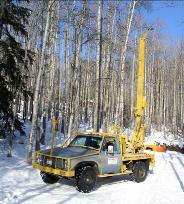 This rig can go through deep virgin snow and swampy conditions. Call for more information about the capabilities of this rig!